Today’s fundraising event planners are turning to smart tech investments that streamline tasks and boost guest engagement. 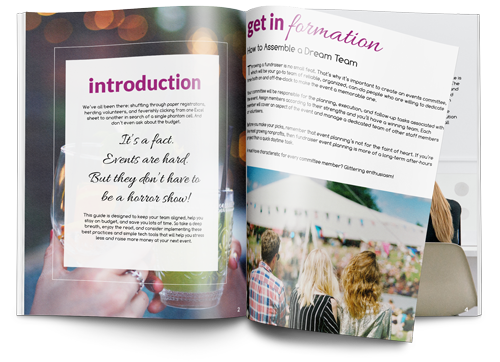 The Fundraising Events Growth Track is designed to help you stress less and raise more by managing registrations, donations, auctions, ticket sales, and event communications all from a single system. The track begins with features in your core DonorPerfect system like integrated monthly gift processing, online donation forms, and event promotions powered by Constant Contact email marketing. Make your events even more successful with expanded capabilities like online auction software with mobile bidding and text-to-give. With the Fundraising Events Growth Track, you can add on even more features that will help you throw the perfect event. Make it easy for supporters to attend your events. Agile Ticketing offers complete event registration and e-ticketing solution for fundraising events. You can use Agile Ticketing to sell general admission tickets to your conference. You can also use the interactive seating chart tool to sell reserved seat tickets in real time. With ReadySetAuction cloud-based auction software, you can become a fundraising auctioneer. Breeze through ReadySetAuction’s easy-to-use platform to set up auctions, add and access listings, manage RSVPs, and more! From guest management to donation tracking, ReadySetAuction records and stores your auction data. Easily roll donor data from one event to the next and export to share. Collect gifts at your next fundraiser in seconds with DPMobile Swipe. This attachable card reader interacts with your DPMobile app to transmit all gift and donor data directly into your DonorPerfect system. Invest in the simplest and most secure way to accept gifts at events. Let your next fundraising event shine without breaking your budget. Get tips and best practices that can help your nonprofit raise more money for less.